So I'll admit, I've been putting off this post, because it's my 100th! Despite such a monumentous occasion (*snort*) I don't know that I have anything particularly exciting to say. Today's topic is reading. My goal for the year was to read 52 books, or one a week. I got behind right off the bat; I'm currently 2/3 of the way through what technically is book 20. Which is a mass market paperback. It weighs in at a hefty 1,241 pages. That's ENORMOUS. Which is the first edition hardcover. (I was in the process of reading the series, so I didn't go out of the way to get the first edition; it's just what there was!). In hardcover, the book is still almost 1,000 pages (though admittedly there's about 50 pages at the end that is the lineage of all the major houses discussed in the book, to help readers keep track of what literally ends up being hundreds of characters). That being said... a 1,000 page hardcover ought to count as more than one book, right? 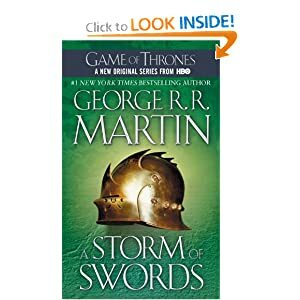 Especially since the other books in the series, Game of Thrones and A Clash of Kings, weigh in at 720 and 784 pages, respectively, in paperback form. 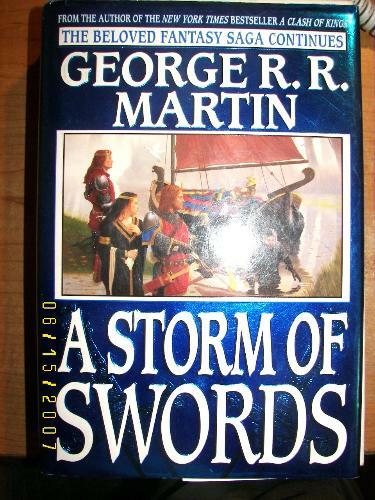 Is it "cheating" to count those two as two books each, and Storm of Swords as three? I'm not trying to inflate my numbers (okay, maybe a little), but to be fair, my copy of Storm of Swords is so big that the binding BROKE - literally, the first 150 or so pages are broken off from the rest of it. It collapsed under its own weight! If I modify my counts (because I'm OCD, and this matters to me, for whatever reason), that would make this reading of Storm of Swords count as books 23, 24, and 25.... which means I've caught up to where I'm supposed to be. A Feast for Crows will also count for two (it's 784 pages as well) and the forthcoming A Dance with Dragons will be three (it's a 1,040 page HARDCOVER). I can't wait for ADwD to arrive. I preordered it a few months ago, and it comes out July 12th. Less than a month to finish ASoS and AFfC. Can't wait! (NERRRRRRRRD).